One must agree that children have many possessions in this day and time. They have clothing, books, toys and other items that require storage. Children’s storage furniture is an answer to storage needs. Having ample kids storage means less time searching for items. It also helps to lessen clutter in a child's room allowing him or her to locate their belongings when needed. Shopping for children’s storage furniture can be a daunting task. There is anything from baskets, storage bins, dressers, bookcases and even beds with storage beneath. Using storage bins is a good way to get kids to clean up after themselves. They come in many varieties. They may be stacked to provide a place for several items such as books, bags, and other accessories. They come in many different shapes and sizes. The storage bins are great for playrooms and bedrooms. Another great idea for kids storage are benches. This item can be used in two ways. The bench opens like a chest and allows for storage or the child may use it for sitting. There are many styles and designs to choose from. Children may store larger toys or maybe an extra blanket. The next item to consider is the child's bed. There are many sizes to choose from in this area. The best choice will avoid taking up a lot of space but have additional storage at the same time. The choices are great when shopping for beds with storage. Some beds have bookcases attached. Others have drawers attached underneath and on the sides. There are storage beds designed for boys and girls. They will love all of the extra room to store their favorite books, toys and other sentimental items. The storage beds may be purchased in different styles and sizes. The twin bunk bed with storage is great for two children sharing the same room. There may be drawers at the end of the bed and underneath along with steps for reaching the top bunk. It is good to keep in mind the child's age and size when purchasing a bed. The quality should be considered which may determine the longevity of the bed. Even though storage beds may have drawers attached they rarely have enough space for all of a child's clothing. There are many dressers to choose from as well. Dressers may be purchased in many styles, sizes and colors. Some dressers may be purchased unfinished meaning it can be painted any color preferred. Dressers should be secured. Children are curious by nature and love to climb. The size of the dresser should be considered especially if two children will share it. Children usually have many toys and a lot of times they are found on the floor. To prevent clutter toy boxes offer an excellent choice for toy storage. They may be large or small and designed with colors that children will be attracted to. There is an endless supply of storage furnishing. All it takes is a little forethought and creativity to make the best choices. Children live in wonderful lands where anything is possible and playing make believe is the norm. Kids love imagining worlds filled with dragons, magic, cowboys, princesses and more. Despite their active imaginations, kids love emulating their parents the most. Feeling like a grownup offers kids more excitement than playing pretend, but no one wants their child to grow up too fast. Kids cars are a great way to let your child act grownup. They will love driving around like mom and dad but still receive the hours of fun and entertainment that a child deserves. A variety of kid cars are available for every type of child or toddler. Kids can cruise around the yard in a sleek sports car, racing vehicles, sport utility style cars and more. Children feel grownup and in control when they can zoom around their yard in their favorite automobile. There are even specialty vehicles available like a fire trucks, a golf carts, tractors, motorcycles and ATVs. Cars for kids have special features just like adult cars. Kid electric cars are a very popular choice among discerning children. These cars have electric motors, let kids drive for hours and are rechargeable. Many choices are lifelike because they have working accelerator and brake pumps, headlights, horns, mirrors and more. Many have power wheel options to make steering easier for little hands. Kids electric cars are luxurious and simple to operate, but some children prefer pedal cars. These cars usually offer vintage designs and are great for more active kids. These also make good starter cars for toddlers or those who have never used electric cars before. Push powered cars are also available for toddlers. The pedal option is also available for planes, so would be aviators can pretend that they are soaring through the skies. Children would be more than happy to ride on kid cars without a second thought, but parents are more cautious. Adults like to be sure a product is safe before it comes near their children. Each car is capable of going a few miles an hour, so kids will not get carried away and adults can select a speed that is right for their child. Pedal cars and remote controlled cars are better options for parents who worry about speed. The electric models also offer benefits because of the power wheel and brake systems. Cars will automatically stop when a child takes their foot off the gas or anytime the brake is pushed. All cars are tested to be safe and are built using sturdy materials, so they will last through the most intense play sessions. Some cars can also be buffed to remove scratches and dents. Kids cars offer children more than fun. Rides on kid cars teach children about navigating and steering. Kids also learn about responsibility by taking care of the car. Kids can learn, stay safe, use their imagination, feel grownup and have a blast on these cars. All parents who are in the market for purchasing the perfect playset for their child or children would naturally consider safety first. They would want a play area that is safe, and one that the child cannot get hurt on because of the way it was manufactured. The next most important feature would be a play area that the child is guaranteed to love, one that will hold the child's interest. A playset should have compelling design and be fun. It should have a swing set and a playhouse either at the top or bottom. It should have a slide for little tots and one for the bigger child. It should be a work of art and one that the children and their friends will never tire of until they actually out grow the playset. This is not asking a manufacturer too much, not where your children are involved. Swings and playhouses will trigger imaginations and creative minds. They will find hours of fun and enjoyment. The parents will not have to worry about rusty parts and nuts and bolts sticking from the parts, waiting to snag little arms and legs. Where do parents go and who can they trust for such an awesome piece of merchandise in the name of safety and childhood fun and memories? When researching play equipment pay a little bit more to assure a top quality piece of equipment. Note how long the business has been active and if there are any ratings or reviews from other consumers. The company should be unique and they should always be knowledgeable in what children love. Look for competitive pricing and warranties on all products. Speak with the customer service department and determine how caring and helpful they seem, or are they just trying to make a sale. Is the customer service department pressuring one towards a sale, or do they recommend that one think about the purchase? Find out how prompt they are in returning calls and answering questions of concern. If one is ordering through an Internet site, find out how secure the sight is, and how protected your information is. What is the security procedure they follow? Is the company certified and approved by the Better Business Bureau? Does this particular company offer specials, clearances or perks? How does the company handle shipping and shipping fees, and how long does it take the consumer to receive their order(s)? As a customer, find out how important one is to this company. After all is said and done and the company can match up to all of your questions and expectations, then one is no doubt when purchasing quality products from a quality company, and it cannot get any better than this. 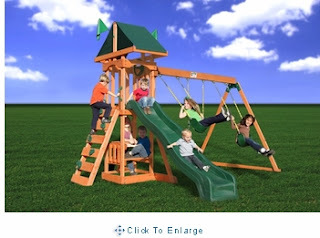 The children are guaranteed to love their new quality wood swing set and playhouse, and the parents will be happy they made a quality investment. No one is denying that raising kids is hard work. Chasing toddlers and wrangling children all days is exhausting and is seemingly a large part of every day spent with children. Not only that, but the messes children leave are frequent and require constant cleanup. And every parent knows that children's toys make up a healthy portion of their children's mess. Many days spent with young children involve picking up toys that have been left strewn about the home. Most parents get sick of this very quickly and purchase toy storage containers in order to help combat the scourge of toy messes. The good thing about toy containers is that there are many of them on the market. Not only that but they come in various styles and price ranges. Whether it's a toy box for a boy or girl, parents are sure to find a unique toy box in their price range. So here are some of the many toy box/toy chest options available on the market. Wooden toy storage boxes and chests can be find at many specialty toy stores as well as from artisan furniture makers. Toy containers and boxes made from wood add a touch of elegance not to mention a vintage look to any children's room. Many times personalization is available for wood toy containers and chests, and customers can add names and images to the outside of the unit. Wood toy containers also come in a variety of colors and sizes as well. This allows for chests and boxes to be purchased for both boys and girls of varying ages. There are toy boxes and chests for everyone from babies to those about to reach adolescence. 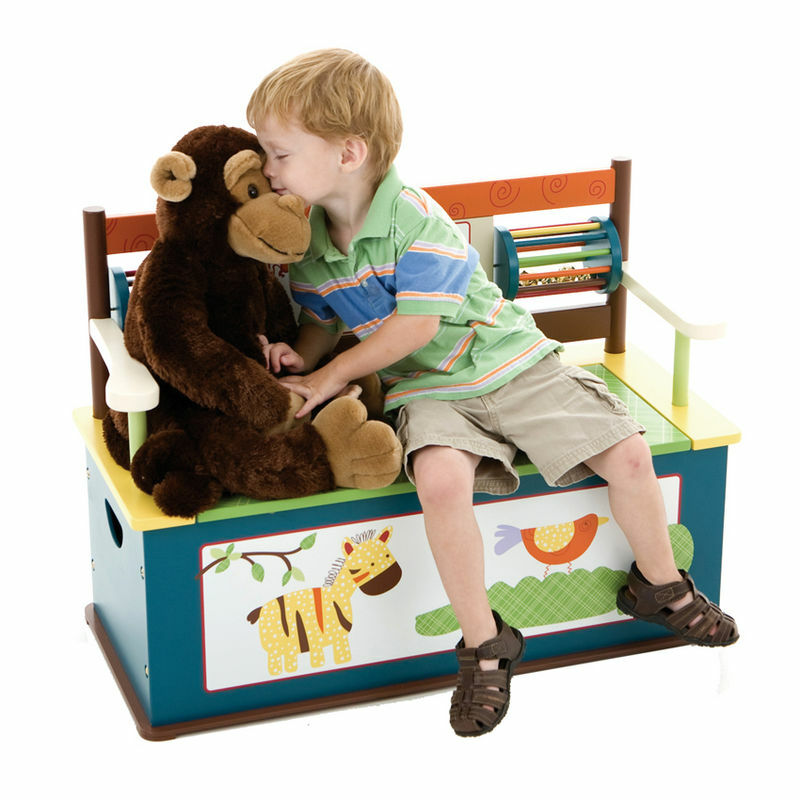 One other popular item that provides dual functionality is the toy chest/bench combo. Not only does a piece like this act as a storage bin for toys but it can also act as a complimentary piece of furniture for any children's room. Chest/Bench combos are made from a variety of materials, but pieces made from wood are classy and elegant. There are now shortage of modern toy boxes and toy chests on the market. The good thing about this abundance is it makes for quite a bit of diversity. There are many options for modern toy boxes for boys and modern toy boxes for girls. They come in different colors, styles and are made of various materials. There are modern wooden toy boxes with elaborate paint jobs and there are toy boxes in various shapes, from treasure chests to trucks. There are toy boxes for girls that come in many different shapes and styles, including that of a chaise lounge. There are even toy boxes for boys in the shape of a firefighter bench. Overall there are many toy containers to fit any personality type. But the most important function of a toy container has nothing to do with style and everything to do with a child picking up after themselves. It is starting to be such good weather that spending time outside is enjoyable. To make sure that your children also get plenty of fresh air and sunshine make sure that there are plenty of activities to keep them busy outside. One of the best ways to make sure they are busy while you are relaxing is with outdoor playground equipment appropriate for their age level. 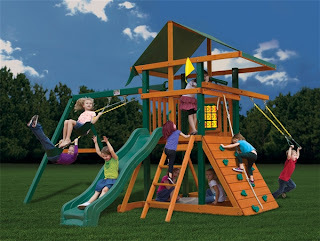 Whether you are a parent wanting to make sure your kids get outside to play or a day care provider, church, or other organization who is looking for outdoor playground equipment. Finding the highest quality is important. When purchasing kids outdoor furniture and play items making sure that they are safe and well made will help you have piece of mind about safety issues. One of the most popular items for backyards is a sandbox or sand table. Children between eighteen months and six years find playing in the sand an enjoyable activity and can spend hours of time digging and sifting in the warm smooth sand. The type of box you choose is dependent on your situation. Tables for sand and sandboxes each have advantages. If you are providing care for many children and having the children stay clean is a issue, then a sand table may be the best investment for you. Children can stand and dig at the table without actually getting sand on their bottoms. A sandbox is great for those who do not worry about keeping sand off clothes and feet. A sand table has the advantage of being able to add water to the sand for the fun of having water and sand to play with also. Sandboxes are generally larger and children can have the thrill of getting feet and bodies in the sand as if they were visiting a beach. No matter which type of children's outdoor play-equipment you choose, kids will have hours of fun digging and making sand creations. A piece of outdoor play equipment that no one should be without is kid's outdoor furniture, small tables and seats make eating outdoors convenient for both children and adults. A well made children's outdoor playset can be purchased and can make staying outside all day enjoyable. These outdoor children's playsets come in many styles such as slides, teeter totters and other climbing structures. A Children's outdoor playset that is properly made can last for many years and will support lots of children playing on them. Find these sand toys, playsets and kid's outdoor furniture can be found online and can be shipped directly to your door. Find all of these unique products online and start enjoying the great outdoors. With all of the great outdoor items available, it may be difficult to get your children inside. A great deal of time has been spent studying the effects of fine arts on development, and statistics have repeatedly proven that children who have been exposed to fine arts and creativity are more likely to excel in life. These children exhibit greater academic prowess, increased citizenship activities, improved fine motor skills, spatial awareness, and problem solving skills. Considering this supporting data, it would seem to be a foregone conclusion that any parent would do well to encourage artistic creativity. For a relatively small investment, a parent can take measures to encourage creativity in art and music from a very early age. Depending on available space, there are creative and captivating kids easels with unique designs that catch the interest of a child. Once he or she is hooked, it is merely a matter of taking the time to model the fun that can be had with the easel. After the child experiences the pleasure of creating masterpieces, there will be no need for prompting. 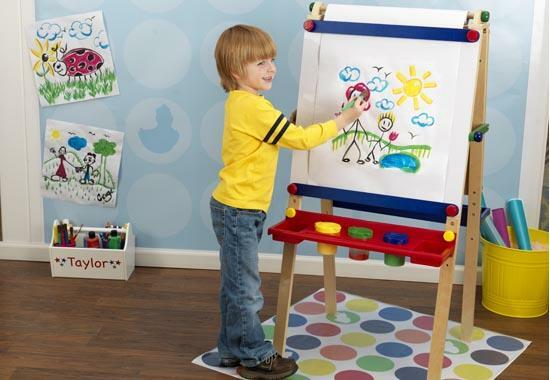 There are many varieties of kids easels on the market today, and there is sure to be one that will work in any home environment. They can be basic no frills affairs, table top models, or a deluxe multipurpose easel with a scroll of paper, a black board, a whiteboard and more. When a child has a special place to create that is all his or her own, he or she is more likely to use it. There is something about a little pride of ownership to kindle an active interest in an item. Art desks for kids, or art tables for kids, can be simple affairs with a scroll of paper to pull over the top, or a simple caddy to hold art supplies. There are yet other desks/tables that have all the bells and whistles, brightly colored with shelves and other enticing traits. While the more elaborate art desks for kids and/or art tables for kids may first draw attention more quickly, but there is no guarantee that the more expensive models will maintain their interest any more than a basic model. Exposing a child to music through kids pianos can be fun and rewarding. They have come a long way in the past few decades. Where kids pianos used to be a small, out of tune tinkling instrument, they have evolved into quality musical instruments designed specifically for children by renowned artists. They can be small table top affairs or miniature versions of a full size upright or grand piano. The amount of available space and budget should dictate purchase decisions. Simple instructions can allow parents to help their child discover the joy of creating recognizable music, even if that parent has never touched a piano before. Considering the proven benefits of fine arts in a child's life, it makes sense for parents to inspire their children to create art and music, and increase their chances of success as they move on in life.